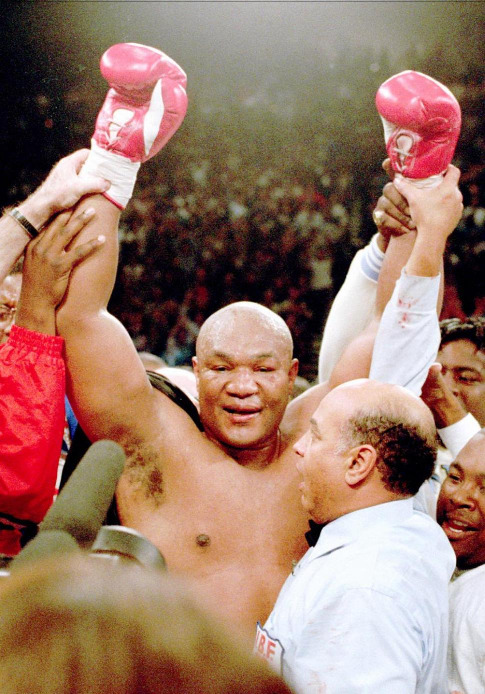 LAS VEGAS - After losing eight of the first nine rounds, George Foreman last night set the boxing world on its ear and Michael Moorer on his back to become at 45 the oldest world heavyweight champion with a 10th-round knockout. Foreman, 45, won the IBF and WBA titles 20 years and six days after he had lost the undisputed heavyweight championship to Muhammad Ali in Zaire. For Moorer, the improbable end came at 2:03 of the 10th round. Foreman, the boxer-turned-preacher-turned-actor-turned-champion, became the oldest man to win the heavyweight championship. Jersey Joe Walcott was 37 when he won the title by knocking out Ezzard Charles in 1951. The shocking victory came in Foreman's first fight in 17 months. The last one was a decision loss to Tommy Morrison. Moorer barely moved and referee Joe Cortez completed the historic countdown at two minutes, three seconds. Foreman knelt in prayer in his corner after Moorer was counted out. The WBC portion of the crown is held by Oliver McCall and Foreman's stunner presents an opportunity for a unification bout of unprecedented proportions. 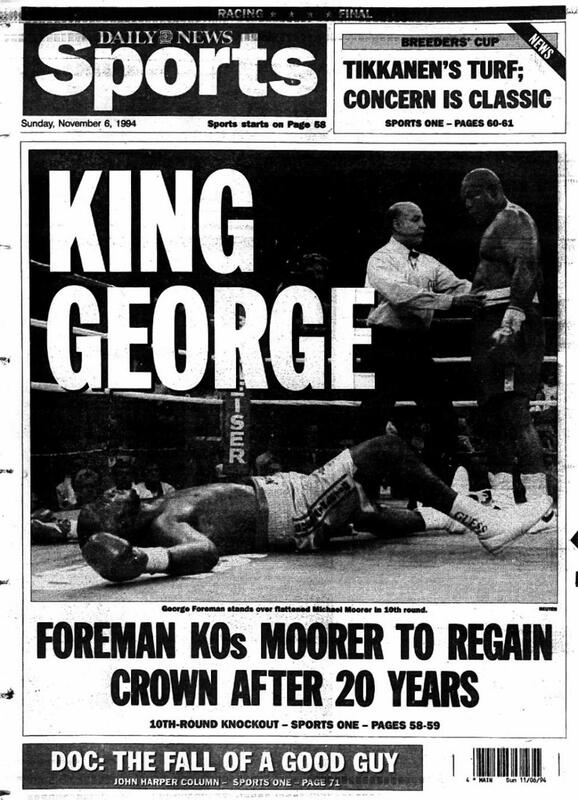 The Daily News' coverage of George Foreman's shocking victory from November of 1994. The long layoff caused many people to wonder if Foreman deserved a shot at the championship. Before the fight, Foreman said "One of these days - it may be Nov. 6 - people will be saying "He (Foreman) got this title shot because he deserved it." They were saying it on the night of Nov. 5. And they were chanting his name and rejoicing at the MGM Grand Hotel. In the excitement, Roy Foreman, the new champion's younger brother, passed out in the ring and was removed on a stretcher. Foreman was given a puncher's chance, but as the rounds rolled by, that chance looked slimmer and slimmer. Moorer, who will be 27 next Saturday, stayed close and took away Foreman's punching room and pounded the old-timer's face lumpy with right jabs and hooks. Then came the deciding moment. "He didn't see the punch coming," said Teddy Atlas, Moorer's trainer. "That was the best punch George threw all night. That's what we were afraid of." Foreman weighed 250 pounds, his lightest since he tipped the scales at 244 for a fight with Bobby Hitz in 1988. Foreman pocketed $1 million for last night's title fight while Moorer, who weighed 222 pounds, was guaranteed $5 million. Moorer, 26, came in the 3-1 favorite. He was making the first defense of his WBA and IBF titles in facing Foreman, whose comeback tour has now lasted as long as his original career. This bout pitted boxing's first left handed champion against a man who had not fought in 17 months, but still carries a big punch. "There's a chance I could get hit and go down," said Moorer (35-0 with 30 KOs). Moorer was knocked down by Evander Holyfield on April 22, but came back to win the fight and the title. Foreman, 45, came into the fight after losing his last bout, a 12-round decision to Tommy Morrison in June 1993. The big man has rumbled only four times since his failed bid to take the title from former champ Evander Holyfield in 1991. He sports a 72-4 record with 67 knockouts but his last victory came 22 months ago, an eight-round technical knockout of South African Pierre Coetzer. Before the fight, Moorer sounded like he didn't believe Foreman deserved a shot at the title. "He's a smart man when it comes to conning people," Moorer said. "He promotes himself. He saw that was the way to get a title fight." 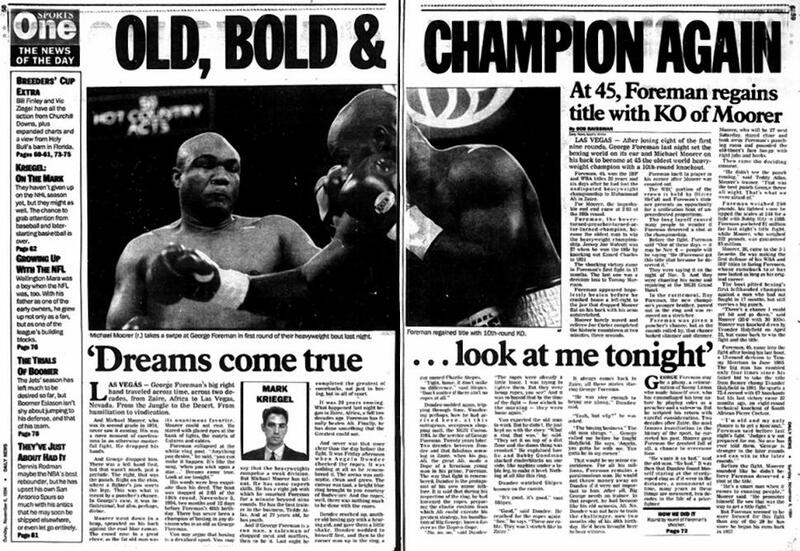 But Foreman seemed to be more focused for this fight than any of the 29 he has since he began his comeback in 1987.